This page is part of the documentation of the VegetationSystem Component. 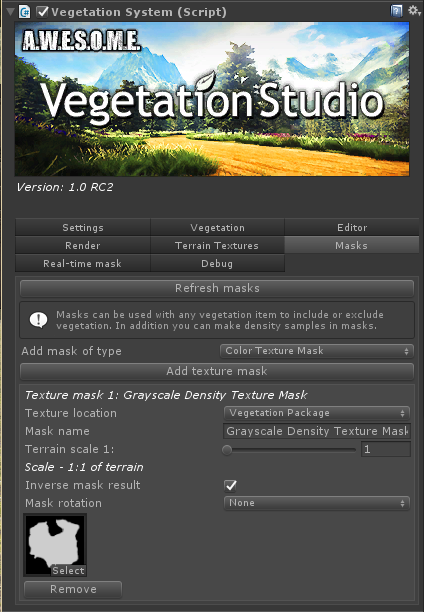 Vegetation Studio supports texture masks as rules for VegetationItems. 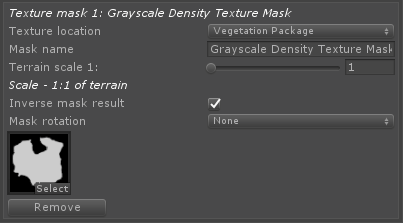 You can add multiple masks and then use them in the texture mask rules section of each VegetationItem. The masks are made using an interface where you can expose settings to the UI. You can create your own mask types that is exposed in the vegetation studio API. Select the mask type and press “add texture mask”. When created the mask is now available to use as texture mask rules. There is many mask types available for Vegetation Studio. More will probably be added. This mask allows you to select a color and a tolerance for include and exclude rules. The average RGB value is returned from this mask. 2 layers are available from this mask. puddles and streams. 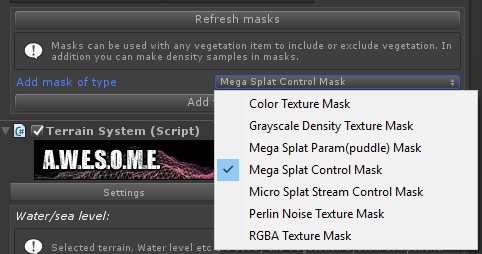 The mega splat control mask lets you select one of the 256 mega splats layers. The coverage value for each location is returned. The microsplat mask lets you use stream, puddle, lava and wetness as spawn criteria. The RGBA mask lets you select a channel and use that for include, exclude and density rules.